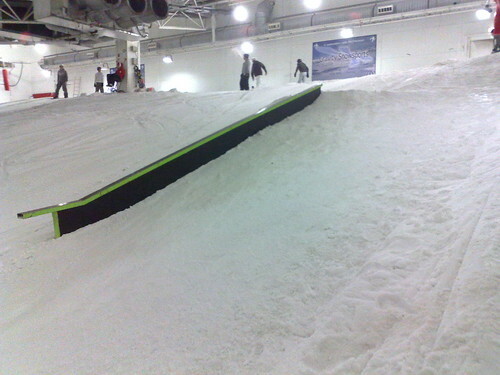 This is where I ride most of the time, SNO!zone MK.Â As you can see it’s not that big, the two main slopes are 175m long, so you don’t really get the “whole mountain” feel while you’re riding, but it is perfect for freestyle and getting new tricks dialled. 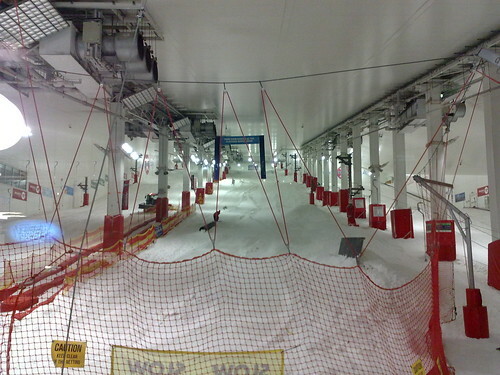 I was really looking forward to last night’s session, it’s been a long hard week at work and I needed an opportunity to switch off and have some fun, I will admit though that as I went up the Poma lift I was a bit disappointed in the set-up, everything apart from the rainbow box was jump on and not easy jump up but proper, jump up and sideways on!Â Even worse, the easiest of the toys was the gas pipe and I HATE gas pipes, I’m just not a fan of their slippery curved tops and even less keen in the corrugated-ness of the pipes they have at MK at the moment, especially because when you wrap yourself around them and slide along on your front it stings! After a fast run down the slope to warm up and get my contact lenses used to the cold I decided to stop being miserable and get on with it, let’s face it it would have been a waste of an evening to have driven 75 miles only to give up and go home because I’m a wuss.Â I was feeling a bit happier than I have been recently as I’d had a couple of good hits on the gas pipe at last week’s Maverix One Trick Pony session, so I went for it.Â Luckily I jumped on fine, clearing the top of the pipe without catching my shins and without jumping too high (this is an issue I’ve had for a while, I tend to over cook the jump to make sure I get on and then I’m unsettled).Â Admittedly I did fall off the far side just before the end of the pipe but all in all it wasn’t a bad start.Â I then spent the evening lapping the park and building up to harder rails, after the gas pipe I tried the flat bar that was just above it, this had minimal kickerage and I was a bit scared I wasn’t going to make it but commitment and courage meant I made it OK, and even managed to stick in a quick speed check and hit the gas pipe as well.Â After a couple of hours sessioning these, I started to feel a bit less sick in my stomach on every run in and decided it was time to give the down rail at the top of the slope a go. This is where my “New Trick OCD” kicks in, if I’m really scared but serious about giving something new a go I find I can’t do it first try, for some reason it just doesn’t happen.Â So there I stand at the top of the slope, looking down at the rail, plotting how to attack it and I drop in, I get my line but just ride off the kicker not popping on to it, just riding past.Â Bac to the top and I do the same thing, I want to do it, I just can’t, I’m chicken and slightly convinced that it’s all going to go wrong.Â I give myself a good talking to as I ride up the lift, I have to do it this time, it’s number 3, no more messing around and not committing.Â I drop in, pop, up and forwards, I’m on the rail, I landed board first, I jump off again.Â I didn’t ride the full length, but I got on it, my breathing’s a bit heavy and I have butterflies in my stomach but at least I know I can get on it OK.Â Back to the top and I do it again, stayung on longer this time , then a couple more aborted attempts (run in not quite right) before The Boyf captures proof on the video camera.Â After that I decided to call it a night, it was almost 11pm (slope closing time) and I didn’t want to risk a silly slam right at the end of the evening. I’m glad I stayed and pushed myself, I feel like I achieved a lot, on the gas pipe and flat bar my arms were much more relaxed and less flayly above my head for most of my attempts and although they were raised on the down rail I know now that I can do it so I just need to keep working on it and let my style improve as I relax a bit and my confidence grows.Â Although it’s Summer that doesn’t mean progressin can standstill.Â I’ve got my first big air comp of the season in 3 weeks (Halifax leg of the Westbeach Snowflex Tour) and then in September the British Snowboarding Championships kick off starting with the Artificial Championships in Norfolk (plastic snowboarding FTW!) and then before I know it I’ll be back in Laax ready to hit the big stuff again.Â I need to keep the momentum and feel like I’m getting better all the time, it makes me happy to improve and although I know a lot of people don’t understand why snowboarding is a sport rather than a hoobby/social thing to me, it is and I love it all the more for it.Â If I finish a session without having learnt or progressed then it’s just not fun for me!